Arthur L. Schawlow, a Bell Labs researcher, and Charles H. Townes, a consultant to Bell Labs, weren’t planning to invent a device that would revolutionize a number of industries, from communications to medicine. They had something more straightforward in mind: developing a device to help them study molecular structures. In the 1940s and early ’50s they had developed an interest in the field of microwave spectroscopy, which had emerged as a powerful tool for revealing the characteristics of a wide variety of molecules. Yet through that investigation into microwave spectroscopy, Schawlow and Townes conceived of the laser (an acronym for light amplification by stimulated emission of radiation), publishing their findings in 1958 as “Infrared and Optical Masers.” That paper, published in Physical Review, the journal of the American Physical Society, launched a new scientific field and opened the door to a multibillion-dollar industry. Townes, armed with a PhD degree in physics from the California Institute of Technology, joined Bell Labs in 1939, where he worked on a variety of problems, including microwave generation, vacuum tubes and magnetics. He then moved on to solid-state physics, studying electron emissions from surfaces. During these war years, Townes was becoming more interested in radio astronomy, but his defense work on radar led him to focus on microwave spectroscopy. Radar systems broadcast radio signals at specific wavelengths. When these signals strike solid objects, such as a battleship or an airplane, the signals that reflect back to the radar system can be correlated to identify the object and its position. The radar navigation bombing systems Townes was working on used wavelengths of 10 centimeters (cm) and then 3 cm, but the military wanted to go to 1¼ cm to get better directivity and to use smaller antennae on their planes. The discipline of microwave spectroscopy was the common ground on which Schawlow and Townes first met in 1949, when Schawlow, having just received his PhD in physics at the University of Toronto, went to Columbia University on a fellowship and began working with Townes. While at Columbia, Townes continued to mull over the possibility of using stimulated emissions to probe gasses for molecular spectroscopy. Townes knew that as the wavelength of microwave radiation grew shorter, its interactions with molecules became stronger, making it a more powerful spectroscopic tool. Building a device small enough to generate the required wavelength, however, was beyond fabrication techniques of the day. Townes got around that limitation with the idea of using molecules to generate the desired frequencies. There were several technical questions that had to be worked out, including getting around the Second Law of Thermodynamics, which, in effect, told Townes molecules couldn't generate more than a certain amount of energy. 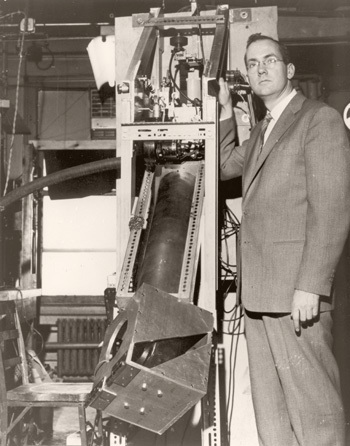 Charles Townes with a ruby maser amplifier for radio astronomy. 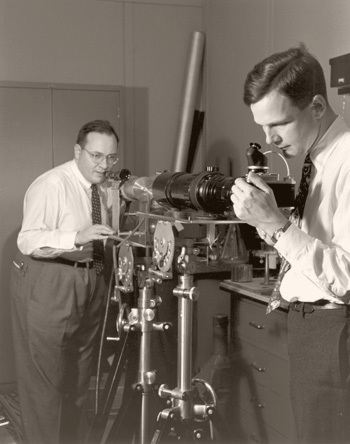 Arthur L. Schawlow adjusts a ruby optical maser during an experiment at Bell Labs, while C. G. B. Garrett prepares to photograph the maser flash. In 1953, he, Gordon, and Zeiger demonstrated a working device, which Townes called the maser, which stands for microwave amplification by stimulated emission of radiation. They patented the device through Columbia University. Townes realized that the shorter wavelengths beyond those of microwaves — the wavelengths of infrared and optical light — probably offered even more powerful tools for spectroscopy than that produced by the maser. Schawlow’s idea was to arrange a set of mirrors, one at each end of a device’s cavity, to bounce the light back and forth, which would eliminate amplifying any beams bouncing in other directions. Schawlow and Townes discussed this possibility and both were enthusiastic about it. In the fall of 1957, they began working out the principles of a device that could provide these shorter wavelengths. By using mirrors, Schawlow thought that their dimensions could be adjusted so that this new device — dubbed a laser — would have only one frequency, that a particular frequency would be chosen within a line width and that the mirror size could be adjusted so that even slight off-angle motion could be dampened. In effect, he was eliminating most of the cavity and keeping only the two ends. “Without interrupting our other duties, over the next few months we worked on this in odd moments,” Schawlow said. While Schawlow was working on the device, Townes worked on the theory. Schawlow also suggested using certain solid-state materials for solid-state lasers. After eight months of work, the collaboration was fruitful. In 1958, the two men wrote a paper on their work, although they had not yet made an actual laser, and they applied for a patent through Bell Labs. Their proposal that the principles of the maser could be extended to the optical regions of the spectrum was published in the December issue of Physical Review. 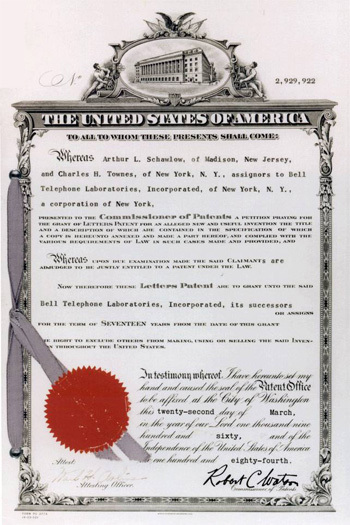 Two years later, Schawlow and Townes received a patent for the invention of the laser, the same year a working laser was built by Theodore Maiman at Hughes Aircraft Company. Soon after, in 1961, Schawlow left Bell Labs to take a teaching and research job at Stanford, where he developed the laser’s use in spectroscopy. “Stanford made an offer I couldn’t refuse,” he explained. In 1981, Schawlow also shared the Nobel Prize in Physics for his “contribution to the development of laser spectroscopy.” “It’s long overdue,” Townes said of his colleague’s honor at the time. The word laser is an acronym for Light Amplification by Stimulated Emission of Radiation, although common usage today is to use the word as a noun — laser — rather than as an acronym — LASER. A laser is a device that creates and amplifies a narrow, intense beam of coherent light. Atoms emit radiation. We see it every day when the excited neon atoms in a neon sign emit light. Normally, they radiate their light in random directions at random times. The result is incoherent light, a technical term for what you would consider a jumble of photons going in all directions. The trick in generating coherent light — of a single or just a few frequencies going in one precise direction — is to find the right atoms with the right internal storage mechanisms and create an environment in which they can all cooperate to give up their light at the right time and all in the same direction. In a laser, the atoms or molecules of a crystal, such as ruby or garnet — or of a gas, liquid, or other substance — are excited in what is called the laser cavity so that more of them are at higher energy levels than are at lower energy levels. Reflective surfaces at both ends of the cavity permit energy to reflect back and forth, building up in each passage. In a ruby laser, light from the flash lamp, in what is called optical pumping, excites the molecules in the ruby rod, and they bounce back and forth between two mirrors until coherent light escapes from the cavity. If a photon whose frequency corresponds to the energy difference between the excited and ground states strikes an excited atom, the atom is stimulated as it falls back to a lower energy state to emit a second photon of the same (or a proportional) frequency, in phase with and in the same direction as the bombarding photon. This process is called stimulated emission. The bombarding photon and the emitted photon may then each strike other excited atoms, stimulating further emission of photons, all of the same frequency and phase. This process produces a sudden burst of coherent radiation as all the atoms discharge in a rapid chain reaction. First built in 1960, lasers now range in size from semiconductor lasers as small as a grain of salt to solid-state and gas lasers as large as a storage building. The light beam produced by most lasers is pencil-thin and maintains its size and direction over very large distances. Lasers are widely used in industry for cutting and boring metals and other materials, in medicine for surgery, and in communications, scientific research, and holography. They are an integral part of such familiar devices as bar-code scanners used in supermarkets, scanners, laser printers, and compact disk players. All quotations are from A Life in Physics: Bell Telephone Laboratories and the Laser, MIT and Government Service, California and Research in Astrophysics, by Charles H. Townes, an oral history conducted in 1991–1992 by Suzanne B. Riess, Regional Oral History Office, the Bancroft Library, Berkeley, 1994, with a foreword by Arthur L. Schawlow. Reproduction by permission of the author.